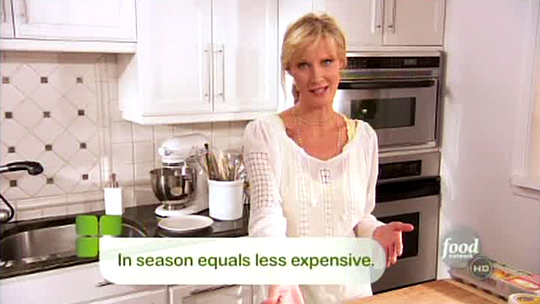 Sandra Lee's new show Sandra's Money Saving Meals premiered yesterday, and we're (gulp) cautiously impressed. The premise is "delicious and money-saving," and to get there she's promoting seasonal and fresh. Gone are the sauce packets, frozen food, and pre-cut vegetables — that stuff is expensive! Turns out, it's cheaper to chop your own damn onions. Did you know that store brands are cheaper than regular name brands? Oh the things we learn from Aunt Sandy, with perky infographics to boot. It was always doubtful that she cooked in real life the way she cooked on Semi-Homemade. But now she's seen the culinary light, rebranding herself as the queen of delicious, fast, money-saving, and seasonal. Given the current economic climate and the trendiness of seasonal cooking, it's smartly-timed. We almost hate to say it, but the show is really well done. 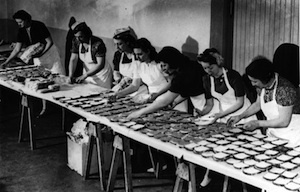 Sandra had dug herself into a hole with her Semi-Homemade schtick — from countless cookbooks (Semi-Homemade Fast-Fix Family Favorites, Semi-Homemade Slow Cooker Recipes 2, Semi-Homemade Grilling 2, etc) to a magazine that blurred the lines between advertising and editorial, the show and her persona had become parodies of themselves. How much further could she take it? Frozen meals? Straight-from-the-can Chef Boyardee? Hamburger Helper? The Semi-Homemade philosophy of "70 percent store-bought, ready-made plus 30 percent fresh" generates some pretty atrocious food. And all of that is out the window. But with Money Saving Meals, we're seeing the Sandra Lee that presumably charmed the suits the first time around. She's a natural on television: never once does she revert to the tried-and-true telling-you-a-charming-anecdote bit, and she's remarkably (and surprisingly) adept in the kitchen, multitasking like crazy, even though she did use the Chop Wizard to "cut up" an onion. Occasionally she succumbs to the pre-prepared, but with reason — her asparagus and tomato tart (recipe) uses a frozen pie crust only because it's cheaper than making from scratch. Yes, she used canned pre-made biscuits for her Mini Apple Spiced Glazed Donuts (recipe), but they looked easy to make and damned good. Who makes their own doughnuts? (See the video below.) Funnily enough, her doughnut segment aired immediately after a commercial for Dunkin Donuts. Oops. This is a strong showing for the Food Network's lineup revamp, although the intolerable cheesy stock background music ruins it and has got to go. The food was impressive and more importantly, honest, and the focus on cost-sensitivity is appreciated. We'll reserve an official rave until a few more episodes have aired, since for all we know this'll rewind back to Semi-Homemade territory faster than we can buzz up our electric can opener. But for the time being, we have to ask: Who is this woman and what has she done with Sandra Lee?